Great savings for instructors preparing for fall classes. ORM-D Commodity. Ground Ship Only. Prices are discounted for quantity. Disposable sterile Fiberglass Brush for latent print development. Packaged in high quality medical craft paper. Glossy Black Latent Print Cards 3" x 5"
Glossy Black Latent Cards 3" x 5"
'JAFL' Latent Lift Tape - 4" x 6"
24 single lift tapes on a pad that fits in your pocket. So handy - so easy. Large format cards (5.5" x 8.5") are ideal for multiple lifts of the same latent prints, palms, feet or a lift of simultaneous latent prints. Printed with the same information as the standard version cards. Latent Lift Tape in a bag 4"
These 4" wide Tapes are supplied on one-inch cores and available in both transparent and frosted versions. Tapes come in a plastic zip-lock bag. Doje's Tapes are shipped in jars to prement contamination, nicks, tears or splitting Available in 1.5 x 360 inch and 2 x 360 inch sizes. Latent Lift Tape in a Jar 1.5"
Glossy White Latent Lift Cards 3" x 5". 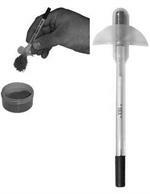 This applicator has a powerful magnetic tip and complete with protective tube. The gelatin lifter is a high quality elastic sheet of rubber with a low-adhesion gelatin layer on one side. 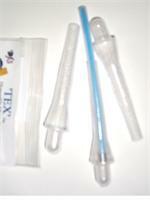 The 'TEX' is ideal for use at hazardous crime scenes. Disposable covers prevent cross-contamination from surface to surface, from applicator t kit and applicator to a jar of powder. 20 Tex™ Ultra Light Disposable Magnetic applicators w/covers. An ideal package for the classroom.